Feeling inspired by none other than our Holy Mother. I see her many times throughout the year, especially during the Christmas season where many people in Santa Ana set up shrines outside their homes or inside to give thanks and praise for the miracles she performs for so many people. Her birthday, December 12th, lands the day before my birthday, December 13th. 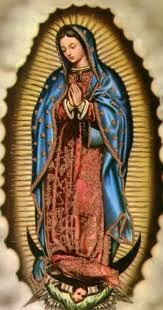 I remember going to 6am mass (well once anyways) with my mother and seeing the adoration of the town to this woman. I have seen her image this past week in a few places and every time I do, it brings a certain feeling in my heart.